A very common and familiar climbing woody plant found on trees, walls, buildings, rock outcrops and cliffs, or on the ground in woods. The plant adheres to the surface of its support by masses of tiny roots. Flowers are produced in winter or very early spring and the flowering branches have different-shaped leaves to the non-flowering. 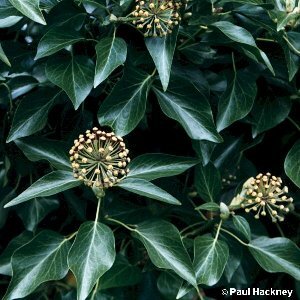 Some botanists split the species into two: Hedera helix sensu stricto and Hedera hibernica. 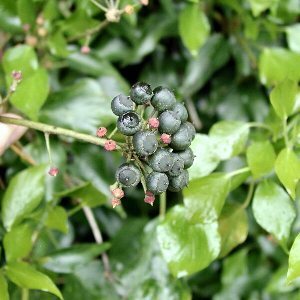 An extreme form of H. hibernica is grown in gardens under the name of "Irish Ivy". All names: Hedera helix L.